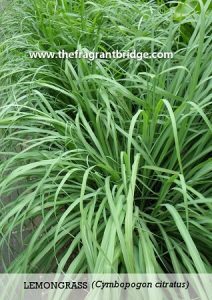 Synonyms: West Indian lemongrass, Guatemala lemongrass, Madagascar lemongrass (C.citratus) East Indian lemongrass, Cochin lemongrass, British India lemongrass, Vervaine Indienne lemongrass (C. flexuosus) Fevergrass. Colour: Yellowy amber to reddish brown (C.citratus) lighter yellowy amber (C. flexuosus). Main Growing Areas: India, Guatemala, Madagascar, Brazil, Malaysia, Vietnam, Comoros islands. Major Constituents: Limonene, neral and geranial when present together in an oil are known as citral, farnesol – antibacterial, borneol, geraniol. Interesting snippets: Traditionally used in Indian medicine for treating infectious illness and fever. The majority of the essential oil is used in the flavour and perfume industries. The fresh leaves are crushed in water and used as a hair wash and toilet water in India. Part of Plant used / Extraction: Fresh and partly dried leaves by steam distillation. 33 pounds of grass yields 1 pound of essential oil. Therapeutic actions: Analgesic, insect repellent, skin tonic, antiseptic, antifungal, diuretic, lymph drainage, oily skin, jet lag, muscular aches and pains, rheumatic pain, tendinitis. Robbi Zeck writes that lemongrass inspires expansion on all levels and motivates you to move beyond any limitations and opens the way for you to step into your best possible future. Deborah Eidson suggests that lemongrass is an energetic tonic to the etheric body and shields the aura from electromagnetic bombardment. Lemongrass softens rigid mental attitudes, changing a pessimistic outlook to one of optimism as well as helping depression rooted in trying to live up to social standards. 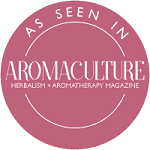 Peter Holmes writes when lemongrass is inhaled in low amounts it induces feelings of renewal and transformation and helps to resolve day to day distressing feelings and emotions. 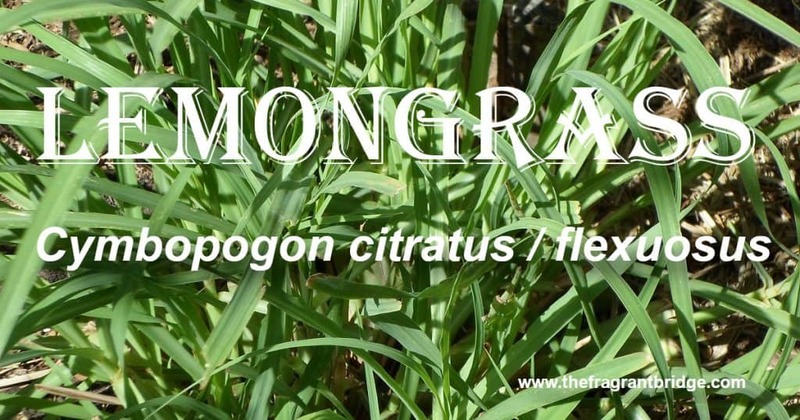 Valerie Worwood writes that lemongrass helps clear regrets and shame and encourages us to forgive those who have dishonoured and discredited us. Susanne Fischer-Rizzi considers lemongrass a secret aid for people who have trouble getting started in the morning. Lemongrass gives you that kick-start to get you going. Expand your mind and environment to a place where there are no restrictions, self-imposed or otherwise. Use curiosity to allow movement into other realms, experiencing new adventures that renew passion and excitement in your life. Remove limitations and restrictions, whether self-imposed or not. Move beyond your normal boundaries and expand into the new. 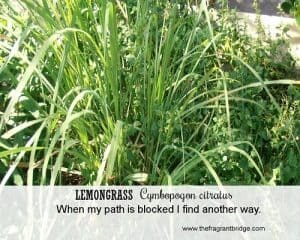 Lemongrass releases the feeling that you are just existing and takes you to the space where you are truly living. 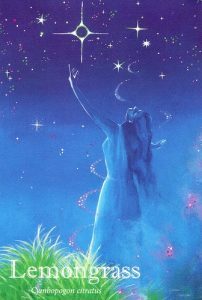 Fragrant Change Healing Card: When my path is blocked, I find another way. Are you feeling restricted on some level, confused, off balance and pessimistic about the present and future? Do you feel that you are just existing rather than living and dreaming of a life that seems impossible to obtain? Do you find it hard to be flexible in your thinking and actions? It’s time to become more flexible when dealing with challenging experiences and life. Shift your attitude to one of optimism about the present and future no matter how dark it appears at the moment. If you are trying to live up to some social standard that doesn’t serve you stop now and decide on your own standards. Live your life according to your own standards. Safety: Non-irritating, non-toxic. Tisserand and Young recommend not using lemongrass on people with hypersensitive, diseased or damaged skin and no topical use on children under 2 years of age. They also recommend a dermal maximum of 0.7% to avoid skin sensitisation. 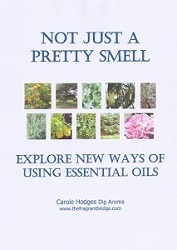 This entry was posted in Essential Oils and tagged anxiety, lemongrass, mental fatigue, muscular aches and pains, stress on April 10, 2019 by Carole Hodges.